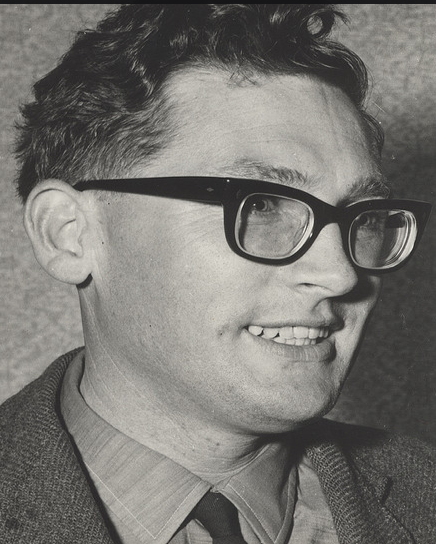 I've already written here about Clive Hart's role in the Great Kiswahili controversy of 1962-3, when he made a passionate defense of creative reading, against Jack Dalton's reductive intentionalism. But how do you find out a book's intentions? How do you find out what a book as odd as Finnegans Wake intends?! 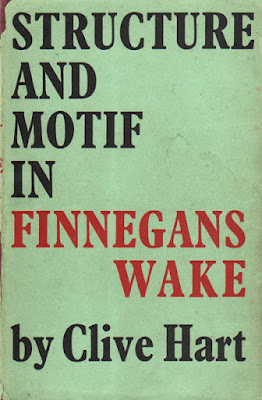 Clive Hart came up with his own answer in Structure and Motif in Finnegans Wake, which he published in 1962, the same year that, with Fritz Senn, he launched the Wake Newslitter. You can read the whole book online in the James Joyce Scholars Collection here. In 1962, nobody knew more about Finnegans Wake than Clive Hart. The following year, he would bring out A Concordance to Finnegans Wake, which combines a list of the 63,924 Wake words with a section called Overtones, listing 10,000 English words suggested by the Wake ones. '-Booms of bombs and heavy rethudders? For the reader, these motifs provide a reassuring element of familiarity in the confusion of the Wake. They are part of the musicality of the book. These motifs are clearly 'intended' by the book, since everyone can recognize them. The problem with Hart's book is when he dealt with Structure. He argued that the Wake is structured on several interlinked cycles, using various dream levels, Viconian cycles and the World-Ages of Indian philosophy (right). I was too in awe of the Joyceans to ask a question in Dublin. But later that year I saw Hart lecture at the University of London, where he repeated the statement that the Wake has no deep structure. At the end I asked him how, having written Structure and Motif in Finnegans Wake, he could say that. He said that he no longer believed in his own book! It strikes me that a creative reading of the Wake, like John Bishop's or John Gordon's, is an act of faith – faith that the patterns and meanings that the reader detects are objectively present in the book. Hart had lost this faith. He viewed those who claimed to understand the Wake sceptically because he understood them. When he wrote Structure and Motif, he had been one of them. My favourite book of Hart's is A Topographical Guide to Ulysses, originally published by the Wake Newslitter Press in 1975. The first edition came out as a booklet, with a separate folder of maps by Leo Knuth. 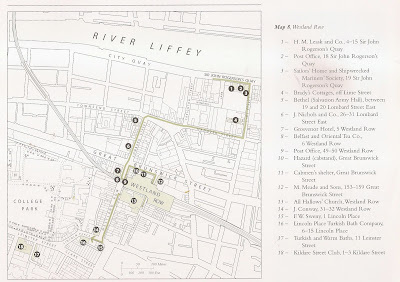 That summer in 1982, I wandered all over Dublin, exploring the city with those maps. For the 2004 centenary Bloomsday, Hart brought out a beautiful hardback edition, published by Thames and Hudson, with exquisite new maps by Ian Gunn. The Guide demonstrates the extraordinary accuracy of the way in which Joyce, writing in far away Trieste, Zurich, and Paris, made his characters move around Dublin. 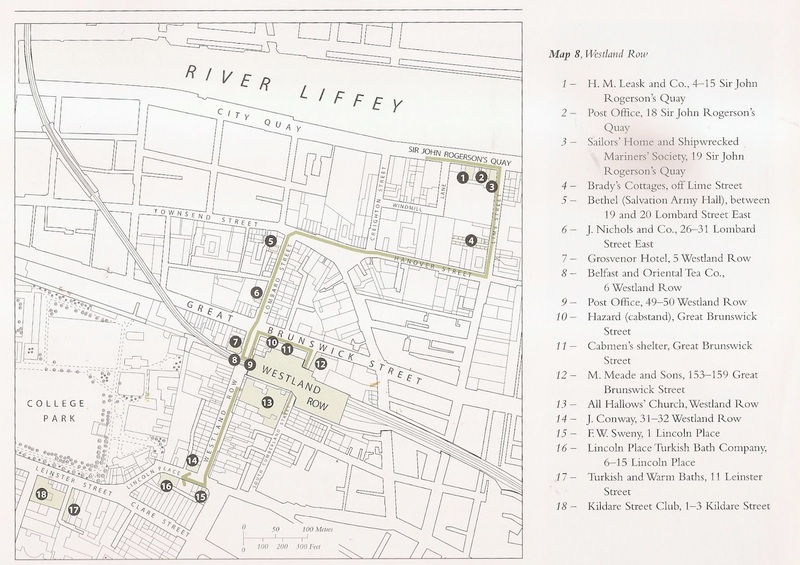 Hart worked out how the novel operates in time and place using 1904 tram and train timetables, and by walking the streets of Dublin with a stopwatch. One of the big events of the 1982 symposium was 'O Rocks', a re-enactment of the Wandering Rocks episode by more than a 100 actors, based on Hart's own tabulation of the chapter. He himself played Father Conmee, who sets the chapter in motion. I followed Bloom around, with a radio pressed to my ear (listening to RTE's all-day dramatic reading of the whole novel). 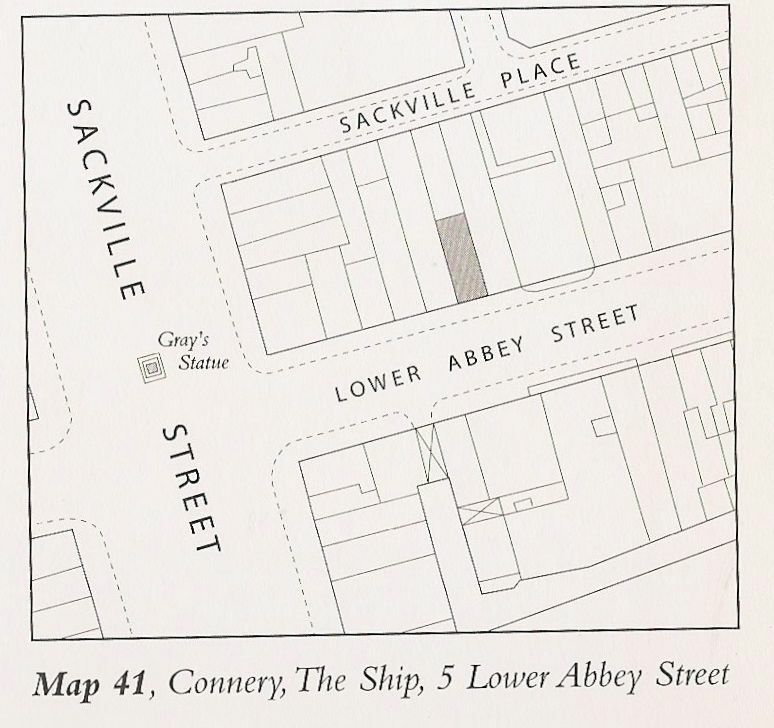 Here's another map, showing the Ship pub at 5 Lower Abbey Street, where Mulligan and Haines wait for Stephen to buy them drinks at noon. Stephen never arrives, sending a telegram instead. –Gentlemen, Stephen said. As the next motion on the agenda paper may I suggest that the house do now adjourn? –You take my breath away. It is not perchance a French compliment? Mr O’Madden Burke asked. ’Tis the hour, methinks, when the winejug, metaphorically speaking, is most grateful in Ye ancient hostelry. –That it be and hereby is resolutely resolved. All that are in favour say ay, Lenehan announced. The contrary no. I declare it carried. To which particular boosing shed? ... My casting vote is: Mooney’s! There are so many things, like this, that we can learn about Ulysses by understanding the topography of the city. If you can't get to Dublin, read the book. 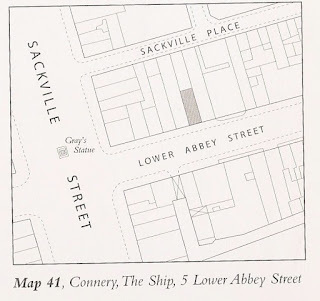 But if you can visit, I recommend walking the streets of Dublin with the Topographical Guide. It's the nearest thing to travelling in a time machine back to 16 June 1904. Only last year, Clive Hart announced plans to bring out a revised edition, which will be 40 pages longer than the 2004 version, and which will have new maps and photos and a whole new chapter documenting the movements of the minor characters. Read all about it here.